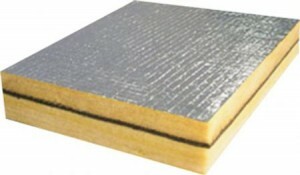 CMS Danskin Acoustics AcoustiShield acoustic lagging material is a five part laminate incorporating an inner 25mm glass fibre spacer or isolating layer backed by woven glass tissue a middle heavy mass barrier of lead or a polymeric acoustic barrier material with an outer 25mm glass fibre spacer with Class ‘O’ foil facing. The heavy mass barrier is available with a surface weight of 5kg/m² for standard applications or high performance requirements a 10kg/m² barrier is available. L5 is with a 5kg/m² lead barrier. L10 is with a 10kg/m² lead barrier. P5 is with a 5kg/m² polymeric barrier. P10 is with a 10kg/m² polymeric barrier.